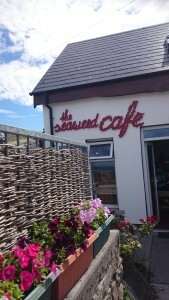 The Seaweed Café is ituated on the hill next to the majestic O’Brien’s Castle, The Café enjoys panoramic views of Inis Oírr, its sister Aran Islands, the beautiful blue seas of Galway Bay and the Twelve Bens of Connemara in the distance. This wonderfully friendly family-run café offers a full menu of home-baked treats, fresh scones and delectable cakes daily (including courgette bread, it’s delicious!). Whether you’re looking for a quick bite to eat or something more substantial you’ll find something in the great menu on offer of homemade soup, brown bread, freshly-made pizzas and mediterranean-style paninis and hot sandwiches. Make sure to try the selection of homemade jams and relishes. You’ll hear the Irish-language on Inis Oírr and whether you just have a ‘cúpla focal’ or are a fluent native speaker please feel welcome to use your Irish in the café, all of our staff speak English and Irish. The Aran Islands are known worldwide for a long tradition of knitting and sustainable crafts and you’ll have an opportunity to see browse through some of the beautiful knitwear in our craftshop corner, including a selection of hats, scarves, baby booties & cardigans on display. We have a lovely selection of beautiful handmade cards, organic natural soaps, and photographs of nature which can be bought in store. Knitting Classes are also available at the Seaweed Café. Learn about the unique patterns and styles of knitting that have been used in Inis Oírr for generations. Beginners and avid knitters catered for through groups or individual classes. Enquire at The Seaweed Café if you are interested in taking a class during your visit to Inis Oírr.